INDIO, CA: The City of Indio will open its second dog park on January 4, 2017, at 9:00 a.m. located next to the Terra Lago Fire Station No. 5 at 42900 Golf Center Parkway. “We heard our community loud and clear about needing a second dog park since Indio has the most animals and pet owners out of any Coachella Valley city. I’m happy we were able to deliver for our residents,” said Mayor Elaine Holmes. Construction of the new dog park included the planting of shrubs and trees; and installation of irrigation, fencing, benches, solar lights, parking spaces, turf, curbs, and sidewalks. The City’s first dog park, Mulligan Dog Park, is located at 45355 Van Buren Street and was constructed in 2007. 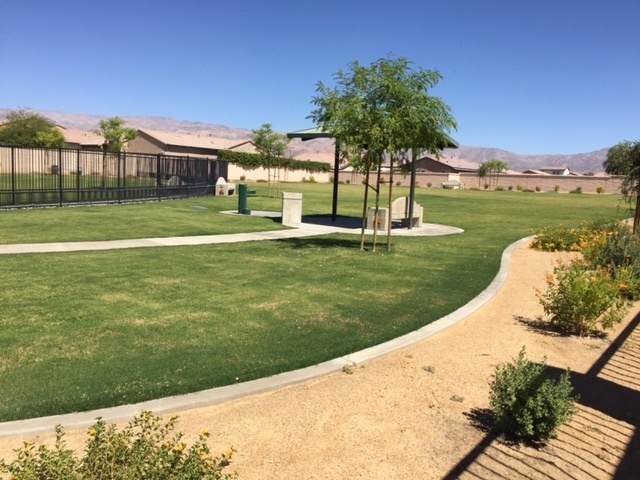 The City of Indio also dedicated three local parks in August 2016 following a series of improvements at Dr. Reynaldo J. Carreon Park, Hjorth Park and Burr Park. Approximately $2.7 million was awarded to the City of Indio by the California Department of Housing and Community Development’s Housing Related Parks Program (HRPP) to construct the new dog park, make improvements to other parks, and create a new master plan for Miles Avenue Park. The City is also planning to make nearly $90,000 worth of improvements at Dominguez Park through a grant that is pending approval from the National Park Service.